May is Maternal Mental Health Awareness Month around the world. Join us in bringing attention in New York State to this vital issue by participating in the awareness month with your organization and within your community. May is Maternal Mental Health Awareness Month worldwide. 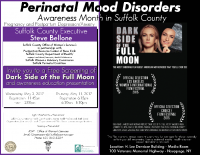 In New York State, The Postpartum Resource Center of New York leads the way each May to make sure New York State residents are further aware of the #1 medical complication related to childbearing, perinatal mood and anxiety disorders (PMAD). With over 50,000 New York State moms and families affected each year, we encourage everyone to become part of the PMAD Safety Net and join in the Ask The Question Awareness Campaign. We invite you to get involved in your community as an individual, organization, health/medical center, faith community, corporation, school or college. Share information on social media, host a community event or training, promote maternal mental health screenings and more. Join us in breaking the silence of the stigma of maternal mental health and help increase awareness to save lives and build healthy families for vibrant communities. Sign up now to become a Participant and use our Maternal Mental Health Awareness Month Digital Toolkit to increase awareness and help families get to the help and support they need! Thank you for supporting Project 62 - Building and Strengthening Perinatal Mental Wellness Parent Support Networks and Safety Nets in all 62 New York State Counties! 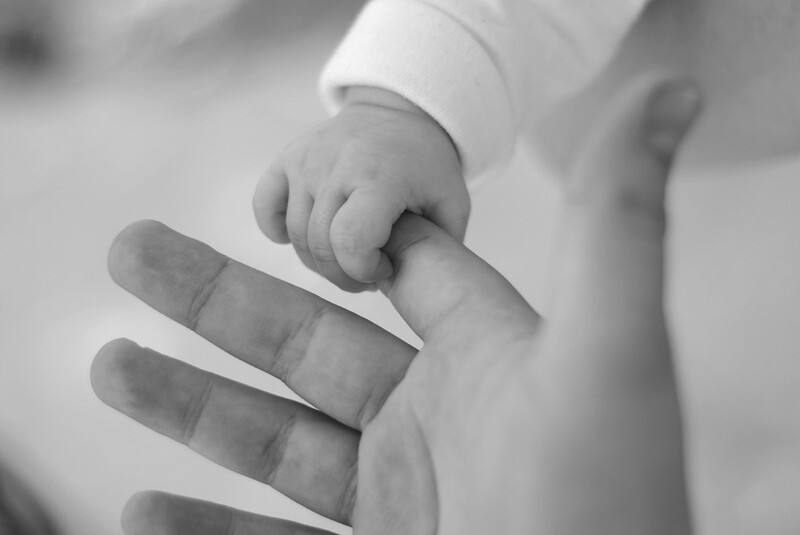 Below you will find our Maternal Mental Health Awareness Digital Toolkit. Click on the images below "About PPD/PMAD", "Action Center", and "Resources" to view them in an interactive format. To Break the Silence for Pregnancy and Postpartum Depression Awareness. "May is Maternal Mental Health Awareness Month". Dark Side of the Full Moon film screening, and panel discussion. Monday, May 1, 2017 from 11am-1pm. Economic Opportunity Commission of Nassau County, Inc., 134 Jackson Street, Hempstead, NY 11550. RSVP to Patricia Jeannis at (516)292-9710 ext.1308. Refreshments Served. Event flyer is below. "May is Maternal Mental Health Awareness Month". Dark Side of the Full Moon film screening, discussion and book signings. 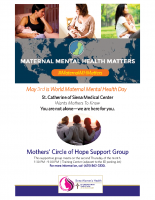 Maternal Mental Health Awareness Event on Wednesday, May 3rd at noon. They will have a table with information and our Mothers' Circle of Hope Support Group will be there to answer questions and discuss our new format. Week of May 1 celebrating World Mental Health Week. May 3rd celebrating World Mental Health Day with Resource Table in lobby at South Nassau Communities Hospital, Oceanside, New York. Event details can be found in the flyer (pdf) below. When: Thursday, May 4 at 1:00 p.m. Event to benefit Postpartum Support International's Cynthia Wachenheim Memorial Training Scholarship for New York Providers. Tuesday, May 23, 2017 from 10:00am to 1:00pm. 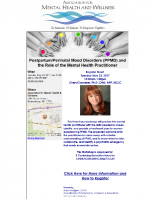 This three hour workshop will provide the mental health practitioner with the skills needed to screen, identify, and provide a treatment plan for women experiencing PPMD. The expected outcome is for the practitioner to come away with a better understanding of PPMD, and to know when to refer, collaborate, and identify a psychiatric emergency that needs immediate action. Workshop presented by: Cheryl Zauderer, Ph.D.,CNM, NPP, IBCLC. Approved for 3 CE Hours (LMSW/LCSW/LMHC/LCAT/LMFT). Hosted by Long Island Doula Association in collaboration with the Postpartum Resource Center of New York. Please use the form below to sign-up as a Participant in this year's Maternal Mental Health Awareness Month. Below is how I/we would like to be listed for the online awareness month page under "Participants". I would like my scheduled event to be listed on the online awareness month page. Please provide details below.